ASTM D2171, EN 12596.Other voltages available. Here shown with TCB-7 Constant Temperature Viscometer Bath. Complete with digital vacuum regulator, vacuum pump, manifold bench top module and glass trap. Supplied complete with UKAS certificate of calibration for pressure. 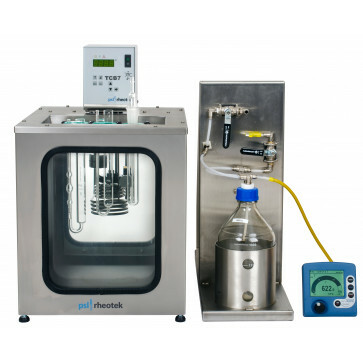 The vacuum system is designed to be used in conjunction with vacuum capillary viscometers accommodated in a TCB-7 viscometer bath. The time is measured for a fixed volume of sample to be drawn up through a capillary tube by means of the regulated vacuum supply at a closely controlled temperature (e.g. 60ºC). 20700-2 Vacuum system for bituminous binders. Complete system with UKAS certificate of calibration. (115V/60Hz). Does not include Constant Temperature Viscometer Bath.